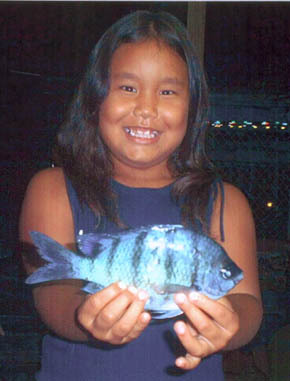 Seven-year-old Kirsti-Ann Togashi was fishing on the Ka'anapali Coast of Maui with her father when she broke the Hawaii state record for mamo. Kirsti-Ann writes, "I was so excited since I casted, hooked and landed the fish all by myself. My dad was so proud and had it weighed at a certified scale at Safeway Supermarket. I caught the fish with my 61/2-foot Master Five Series pole and Shimano 4000 reel loaded with Ande 8-lb test."